You guys…I am seriously a MONTH behind in my schedule! I keep remembering when I was little girl and hearing adults talk about how time just seems to speed up. It’s true. I thought they were just making it up. I think I’ve made it to a week equaling what used to be a day. Why does time do that? So like 6ish weeks ago (or 6 days if you’re counting in my time), I told you about a new series that I wanted to start on this here blog called Creating Happy Kids. 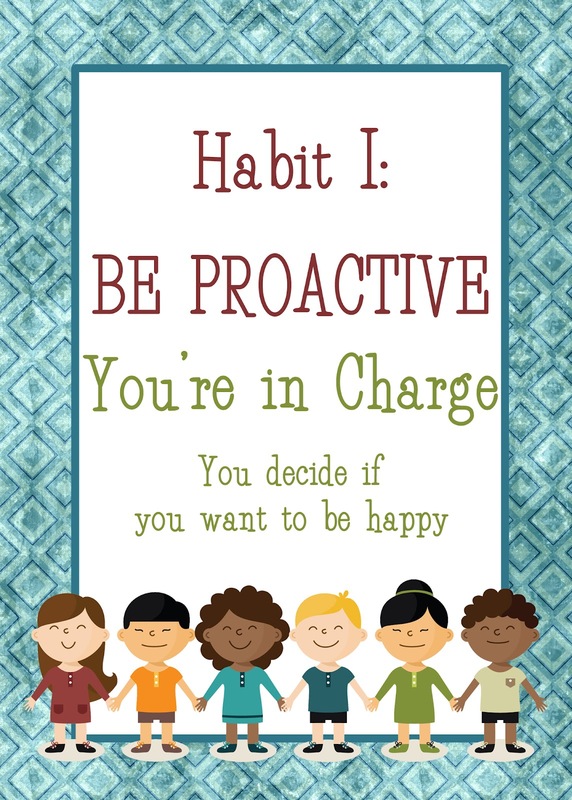 And I was going to use The 7 Habits of Happy Kids book as the platform to build from. Ummm. Yea. I wasn’t a very good blogger. I told you all that I would post about our first habit on September 7th. What day is today? September 28? 3 weeks late (or really only 3 days in my time, right? That helps me feel a little less guilty). Well, if it is in any way redeeming to me, my 6-year-old son broke his arm completely in half and had to have emergency surgery on September 2nd. My plan was originally to introduce MY kids to the series on September 2nd and share it with you all on the Friday after. Then, the whole broken arm thing happened, and it more or less threw my whole plan out the window. Really, a lot of my plans for that first 2 weeks. It’s hard on a 6-year-old to have surgery! Well, I’m jumping back into it now! It’s imperfect this month, but such is life. So, my new plan is to introduce YOU to the next month’s habit sometime during the last week of the previous month. So, for October, we’ll work on the first habit. Then, right before November, I’ll introduce habit 2. Does that work for everyone? There are only 7 habits, so we should be done sometime around the end of the school year. In the book, Sammy the Squirrel is bored and looks to other characters to fix the problem for him. Obviously, that doesn’t work because Sammy needs to learn that he is in charge. In real life, I was a little worried about telling my kids that they are in charge. My daughter especially. She is a natural leader and tends to try to lead (and correct) mommy all the time. I was actually leaning toward telling them that they get to decide rather than they’re in charge. But, after a lot of thinking and considering, I went with the You’re in Charge motto for this habit. But, with the stipulation that it meant that they are in charge of their own ACTIONS and FEELINGS. The first real life example that we were able to apply it to was one day after the older kids got home from playing with neighbor kids after school. We told them they could play but only until 5:30. Well, 5:45 rolled around and they still weren’t home. So, I had to call. They came home full of excuses as to why it wasn’t their fault that they were late. We explained that they are in charge of their own actions, so they couldn’t blame someone else. We talked about things they could do to prevent that from happening again – like asking the other mom to help them watch the clock or call home to ask permission to be late, etc. I loved having something to fall back on instead of just grounding them and not talking it through. It turned something that could have resulted in crying, angry kids into a teaching moment. In the meantime, I’ve been (slowly) re-reading The 7 Habits of Highly Effective People . I only want to read each habit as quickly as I’m going through with my kids. Well, it turns out, I have some Proactivity to work on myself. I’ve read the book before, but it’s been quite a few years. In my foggy memory, I thought being Proactive was more about being productive and getting things done. You know, taking charge of your life. That is part of it. But, it’s so much more than that. It’s also about being in charge of your feelings and reactions to situations beyond your control. I can’t tell you how many times I’ve blamed my bad mood on the weather. Or, decided that it was someone else’s fault that I felt offended. Not my finest behavior for sure. And I think some of my behavior has rubbed off on my kids when they blame ME for making them mad (sorry, kids – you do have to do your homework!). Or blame their teacher for a boring day at school (since when did they decide it was teacher’s job to be as entertaining as playing a Wii game?). I want my kids to take responsibility for their own actions, feelings and behaviors. If school seems boring, what can you do to fix that? You’re not in charge of the curriculum or the teacher, but you are in charge of your attitude, or how engaged you are, etc. You’re in charge of yourself. At the back of the book, there is a picture of a 7 Habits Tree. I love the use of a tree. The first three habits are about establishing our roots so we can grow. We showed our kids what all of the roots are, but explained that we’re mainly working on establishing the habit of Being Proactive right now. Once you master the first habits, you can work on growing and branching out. So, are you playing along with us? Have you talked to your kids about being proactive? This is a good post. For my older kids, I’ve really impressed on them, that they have to own their actions and own who they are. I think as parents we need to let them be in charge of who they are but also let them know that for every action they make there will be a reaction. Honestly, sometimes it works well and other times they have to learn from their mistakes. However they also know the rules and should they choose to disobey, they will receive a fair punishment. Read the book and love it. Looking forward to the rest of this series as I’ve decided to incorporate this into my family as well. I also read “The Leader In Me” that you previously blogged about. It is very good too. Makes me want to find one of those leadership schools and move there to send my kids to that kind of school.